When Blizzard announced Overwatch my first reaction was a resounding “meh”. Not that I don’t like team based shooters, quite the contrary. I even was in an Unreal Tournament clan for a while (back when 2k4 was the current title of the series). I still like to play shooters. I just like to play other genres even more now, I guess. The last shooter I played quite extensively had been Modern Warfare 2. There’s also Blizzard’s affinity for comic style graphics, which I’m not fond of in general. I refused to try out Diablo 3 because of that, although I had played 1 and 2 excessively and love them to this day. I never tried WoW either, despite my penchant for MMORPGs. I’m not a sucker for high end graphics per se; if the gameplay is good I don’t mind if it’s engine looks like it’s 15 years old. It’s just this overly stylized look I’m not into. A few weeks after Overwatch’s release a couple of friends tried to talk us into playing it with them. They told us about some of the more unusual characters, which piqued Lakisa’s interest, because she doesn’t normally play shooters at all. I still wasn’t convinced though. 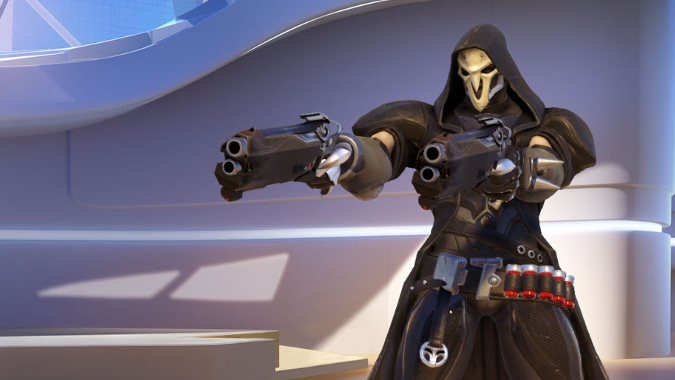 Then I saw an article about the game, and the headline picture was one of Reaper. I can’t find the article anymore, but it might have been this picture. Doesn’t really matter, he always looks badass. “I HAVE to play this character” my inner self screamed. To be sure I looked up some info about how he actually plays. Suffice to say he plays as badass as he looks, so I said to Lakisa “You know what, let’s buy Overwatch”. It really is a great game. It’s incredibly polished, as is everything Blizzard does, and the attention to detail is nothing short of amazing. For what is essentially nothing but a 6 vs 6 lobby shooter, the world and the characters are fleshed out in finest detail. Having played on and off for about a year now I know these characters and locations as well as those of TV shows running for eight or more seasons. Granted, much of the lore and backstory comes from out-of-game sources Blizz has created, like these incredible animated shorts made to introduce some of the characters, or these comics for additional stories in the Overwatch universe. But much of this also seeps into the game, like voicelines the characters say to each other automatically when they meet, or little details like the arrow Hanzo shoots at Genji in the “Dragons” animated short still sticking in the ground at that exact spot in Hanamura. Blizzard’s attention to detail is really second to none in my opinion. It also plays really well, obviously. And much to my amazement, I’ve come to really like the stylized look, so much so that I wouldn’t have it any other way now. We’re also having a lot of fun watching pro tournaments. It’s very interesting to see players on such a high level play the game, and the commentary is usually pretty good and entertaining. For all these things, I love Overwatch. But I also really hate it. For me, playing in a competitive environment means playing to win. I just can’t help it. Intellectually I know that playing a game is (or should be) first and foremost about having fun. And I do play to have fun. It’s just that having fun in this type of game means fighting as best as I can, and hopefully winning. I wouldn’t say that I’m a sore loser. Naturally, some might disagree. I’m just saying that I can enjoy myself despite losing, as long as I and everyone in my team gave my and their best, and we had a good fight. A loss in Overwatch seldom feels like that to me. Most of the time when my team loses, I feel that either myself, or (more often) people in my team were too ‘stupid’ to win, for lack of a better word. I feel that not eveyone picked the best hero for the situation, not everyone played their picked hero to his/her potential, the hero of a very strong player in the enemy’s team wasn’t properly countered, and so on and so forth. It frustrates me to no end. More than any other game has ever managed to frustrate me. So. What to do when everything about a game is much more fun than playing the actual game itself? I’ve never had this problem before (and yes, I do realize it’s very much a first world problem). If I figure out the answer, I’ll let you know.